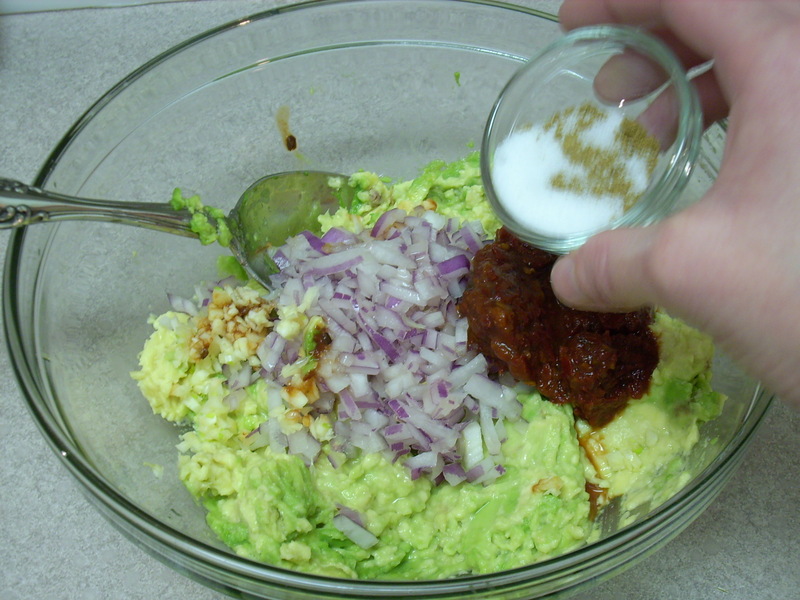 Making your own guacamole is so simple that I don’t know why I didn’t start doing it sooner. We had always just purchased store bought. Most of them weren’t good at all. Whole Foods does make one that is pretty darn good, but I didn’t like making the 15 minute drive there just for that. 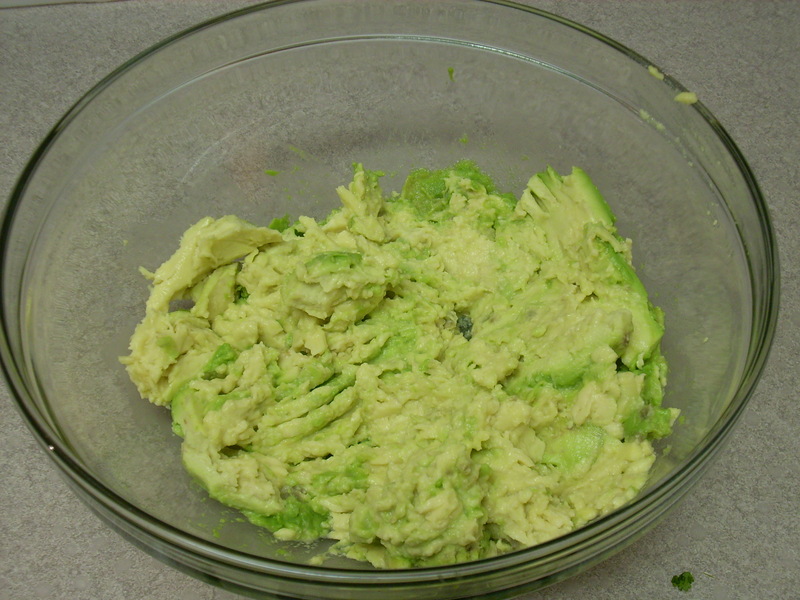 There is also one on the market called Wholly Guacamole that is okay, but nothing quite beats making it fresh at home. 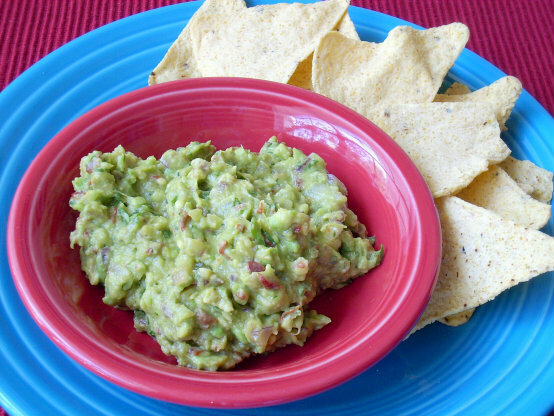 In my version of this tasty dip I use chipotle peppers, which add a nice smoky and spicy flavor. Technically, this probably should serve about four people, but it is so good that my husband and I have been known to polish it all off by ourselves. If you have a lower heat tolerance, you can always use a smaller amount of the chipotle peppers. 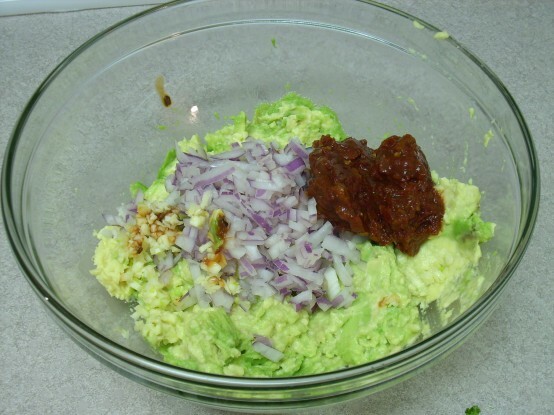 2 ripe avocados (I only used one because they had these jumbo sized ones at the store that day), 1/2 cup red onion (finely chopped), 3 chipotle peppers, finely chopped (from a can of chipotle peppers in adobo sauce), the juice of half a lime (about 1 tbsp), 1/2 tsp salt, 1/2 tsp cumin, 1 clove garlic (finely minced), 2 tbsp cilantro (chopped) . 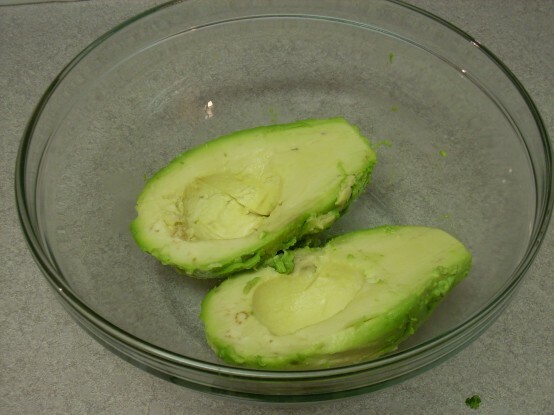 Cut the avocados in half, and remove the pits. Use a spoon to scoop out the flesh of the avocados, and place into a bowl. Mash the avocados with a fork. 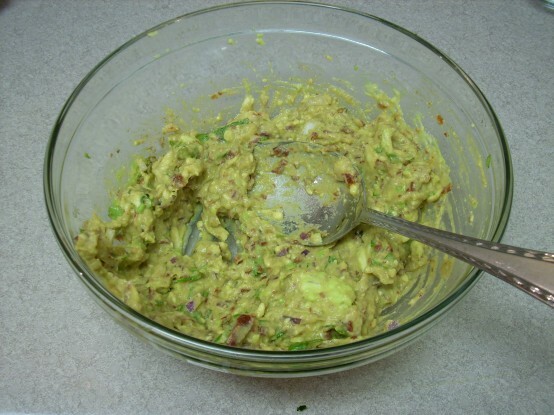 I like my guacamole on the smooth and creamy side (no chunks at all), but take it to whatever consistency you prefer. Add the 1/2 cup finely chopped red onion, 3 finely chopped chipotle peppers, and the clove of garlic to the bowl. 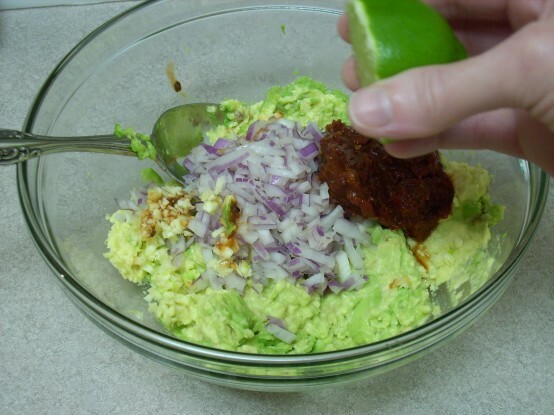 Next, add in the juice of half of a lime (about 1 tbsp). Add in 1/2 tsp. each of salt and cumin. Throw in two tbsp. of chopped cilantro. 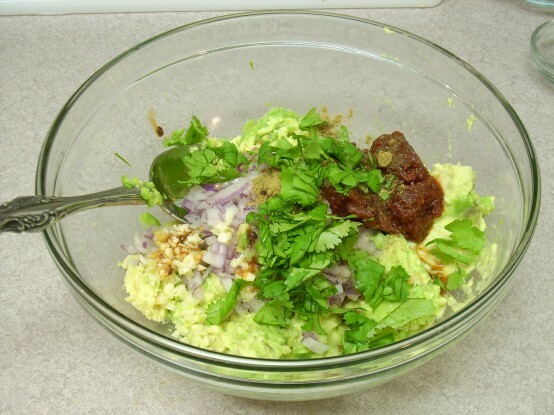 Stir all of the ingredients together to combine. 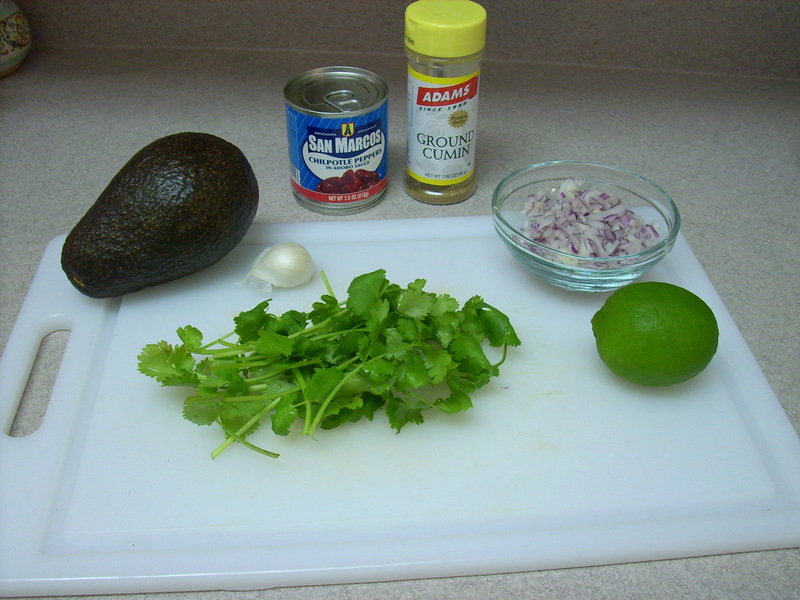 You can make this an hour ahead of time to allow the flavors a chance to combine, but we usually devour it right away. If you do make it ahead, place a layer of plastic wrap directly onto the guacamole to protect against oxidation. By Tempie at May 1, 2015 .